I met Prof. Kohen Raz for the first time fifteen years ago. I saw a publication in Percept. Mot. Skills Journal* and contacted him. He happened to be coming to Milan, we met and I was introduced to Tetrax. Our brain is “movement ready”. Even when we’re completely steady and motionless it is wired for movement. This is the underlying concept that enables Tetrax to measure the ability and quality of movement even when a person is standing still. So it is not necessary to observe a subject’s movement. 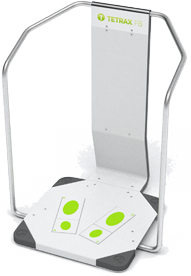 You can measure their stability through Tetrax and analyze the findings to predict how the person will perform. This very same concept has just been described in a new book by the French physiologist Alain Berthoz “Simplexity”. Tetrax embodies Simplexity: simultaneously simple and complex. AND it can also provide a vehicle for sophisticated and complex research. There are many systems and ways to measure and observe the instability of a patient. But only Tetrax can show you the HOW – what is the character of the imbalance? When we quietly stand in an upright position, we sway. Sway is apparently random but mathematical analysis of this sway (called Fourier Frequency Transformation) shows that sway is like a painting: the final observable aspect of sway is a combination of different colors (different frequencies). Every patient is like a painting. Tetrax is able to measure the combination of these “colors” and thus enables the clinician to understand if the “painting” is correct (harmonic) or not and determine if and how to modify some aspects of this painting. In this way a clinician can address rehabilitation in a very precise way and is able to follow-up improvements of patient balance even before general stability improves. My specialty is vertigo and balance disorders. I use Tetrax every day as part of my lab equipment for diagnosis of various disorders, as well as for diagnosis and rehabilitation of Multiple Sclerosis, and for research. In my research with hockey players, we compared professional and amateur players, both groups being very strong and with good balance. But only Tetrax uncovered that the quality of balance in professional players was markedly different and better than the balance of the amateur players. Similarly, comparing young ice skaters with other athletic girls: They were all stable and strong, but Tetrax showed a distinct difference in weight distribution – a quality of balance that was specific, completely different and better in the ice skaters. In MS rehabilitation we have extensive data (as of yet, unpublished) showing a modification of distribution frequency: the Tetrax rehabilitation system can help improve the ability of patients to maintain an upright position using less energy and thus minimizing fatigue. We are currently using Tetrax to collect data on dyslexic children – there is a clear connection between dyslexia and balance. These are just a few small examples. I use Tetrax everyday in my clinical activities, but I am well aware that I’m using only 50% of the power and potential of this system. I wish I had more time to research and understand all of it. Tetrax is ahead of it’s time, too modern for doctors like us; it will a job for the next generation of doctors to uncover it’s full potential. It is the instrument of the future. * Kohen-Raz R, Himmelfarb M, Tzur S, Kohen-Raz A,Shub Y. An initial evaluation of work fatigue and circadian changes as assessed by multiplate posturography. Percept. Mot. Skills 1996; 82: 547–557.